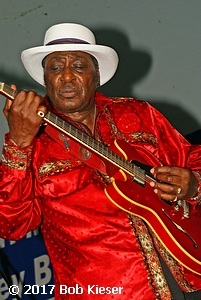 Over the last six decades, Eddy Clearwater has experienced every facet of the blues business. “It’s just a song I had in my head. I was just playing around with it,” says Clearwater. “I said, ‘I’ve been all around the world, when I settle down; I’ll settle down in Skokie because Skokie is a first-class town.’ I was just kidding around. 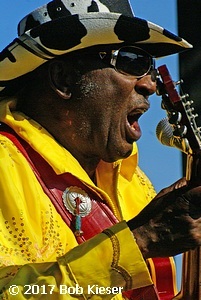 I said, ‘I think I’ll make a song out of that!’” If all goes as planned, it’ll be on his encore album for Alligator, planned as a belated follow-up to his critically acclaimed 2008 studio set West Side Strut (Clearwater released the live Soul Funky in 2014 on his own Cleartone imprint). Skokie will present Eddy with a proclamation on January 2 honoring him for his long residence in the suburb. Eddy Harrington was born in rural Macon, Mississippi, not far from the Alabama state line. He and his older brother were raised by their grandparents. “I never knew my mom and dad,” he says. “I got to meet my dad twice in my life. My mother, I never even met her. 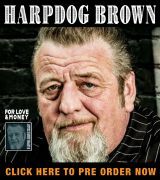 She was killed when I was very young.” Eddy wasn’t the only future bluesman in the family: harmonica wizard Carey Bell Harrington, another Macon native, was his cousin, and his considerably younger cousins Vernon and Joe Harrington later played blues in Chicago as well. That uncle, Rev. Houston H. Harrington, played a huge role in Eddy’s life. He was responsible for sparking Eddy’s interest in playing guitar. “My uncle had an old acoustic, and I’d hear him playing around with that thing. But I didn’t think it was okay for me to touch it. So I would listen to him and look at it, but I wouldn’t dare touch it without his permission. So they all left the room one day. They left the bedroom and left the guitar lying on the bed. So I sneaked up to it and I plucked the strings a little bit. He walked in and caught me. He said, ‘No, go ahead and play it! It’s okay!’ So when I realized it was okay to pick it up, then I started picking it up.” The guitar was strung for a right-hander, but Eddy was a lefty. He flipped it over and never looked back. Rev. 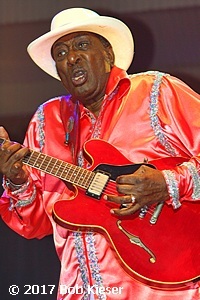 Harrington had established his own label, Atomic-H, to record local gospel groups and an occasional bluesman (Homesick James Williamson did a single for him under the odd handle of Jick & His Trio). Naturally, he asked his nephew to record for him. So in 1958, the newly christened Clear Waters debuted on Atomic-H wax with “Boogie Woogie Baby” and the Berry-tinged “Hill Billy Blues.” The single was cut at Balkan Studios in west suburban Berwyn with Lazy Bill Lucas on the 88s and Eddy’s regular rhythm section. The action shifted to Chicago’s Hall Studios for his ‘59 Atomic-H encore, pairing the choppy “I Don’t Know Why” with the quintessential West Side instrumental, “A Minor Cha-Cha.” “I just had an idea for an instrumental, so I started kind of plucking around with it, (saying), ‘Let’s put this on tape and see what happens,’” Clearwater says. The Chili Peppers introduced Clearwater to local rocker Eddy Bell. “He was a big Buddy Holly fan,” says Clearwater. 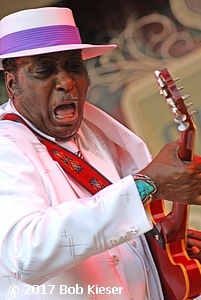 In addition to gigging with Bell’s Bel-Aires around Fox Lake, Eddy played on Bell’s rocking 1960 Mercury single “The Masked Man (Hi Yo Silver)” as well as Bell’s followup the next year on Lucky Four, “Johnny Be-Goode Is In Hollywood.” In addition to blues joints, Clearwater was now making the rounds of local sock hops. “Every Sunday, all of the kids would come out to the record hops,” says Eddy. When rock and roll failed to make Bell rich, he became a polka star under his real surname, Eddie Blazonczyk. Pianist Sonny Thompson, King Records’ Chicago A&R man, recruited Clearwater in 1961 to join the Federal label, just as he had West Side powerhouse Freddie King the year before. Eddy went to the company’s Cincinnati headquarters and cut four sides, again exhibiting Berry’s influence. The band was an all-star Chicago aggregation, with Bobby King on the other guitar, Jesse Anderson on sax, Emmett “Tut” Sutton on bass, and producer Thompson tinkling the ivories as Clearwater rocked through “I Was Gone” and its plattermate “Twist Like This.” He encored with “A Real Good Time” and its B-side “Hey Bernadine,” Federal finally included his first name on both singles, misspelling it “Eddie.” King label owner Syd Nathan left a lasting impression with his nub of a cigar. “He was chewing on it while he was behind the board,” laughs Clearwater. Things got sparse for Eddy on the recording front after that. 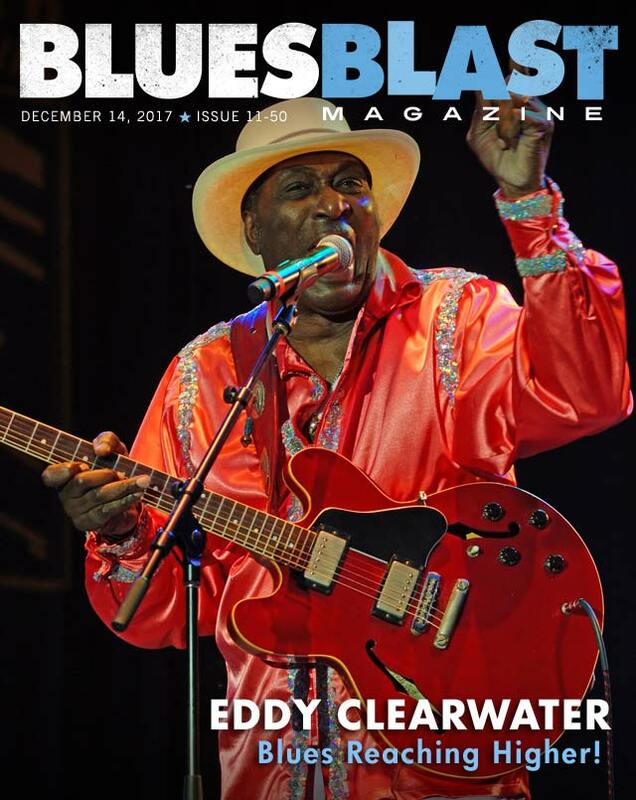 He had a 1966 single on Chicago’s USA label that barely saw light of day, the imprint reverting to his old “Clearwater” handle with no first name as the guitarist waxed a double-sided tribute to his musical hero. 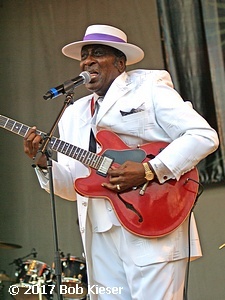 “The Duck Walk” waxed rhapsodic about Berry’s favorite stage move, while he described a teenage girl begging her folks to attend a Berry concert on “Momee, Momee.” The single was produced by Jimmy Reed’s manager, Al Smith. “He was a little short, stubby guy, and he played a big upright bass, just like Willie Dixon,” says Clearwater. There were plenty of fine Clearwater albums after that. Flim Doozie (1986, with fellow southpaw Otis Rush guesting on guitar) and “A Real Good Time” Live! 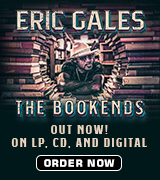 (1990) for Rooster Blues preceded 1992’s Help Yourself on Blind Pig and a string of CDs on Bullseye Blues: Mean Case of the Blues (1996), Cool Blues Walk (1998), Reservation Blues (2000), and Rock ‘n’ Roll City (2003), the latter a rockabilly outing with Los Straitjackets in romping support.